Whether they focus on residential or commercial jobs, these cleaning companies know the importance of making a good first impression. So, they trusted us to handle their online presences. Take a peek at what makes each of these companies unique. Owner Penny Harris recently opened a second location in Hampstead, NC to work with vacation homeowners in Surf City and Topsail Beach. Harris Cleaning Services won the award for best cleaning service in 2017 in Lee County, NC for her Sanford, NC location. President Marcellus Sharpe is personally involved in the business’s day-to-day operations and remains easily accessible with the goal of creating a transparent working relationship with his clients. He serves all of Rhode Island, southern Massachusetts and eastern Connecticut. He focuses primarily on office building cleaning. Marcellus also has three grandchildren, and the oldest is 5. Andrea Dilly, one of the owners, has worked as a realtor for 14 years. Her clients often ask where to find the best Orlando cleaning services. 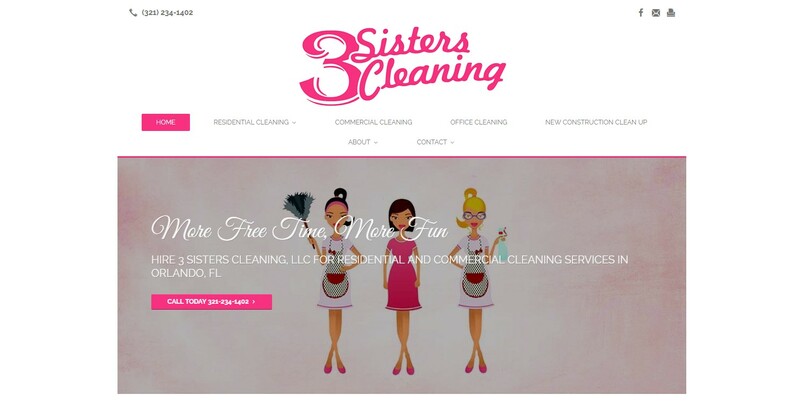 After consistently making such referrals, she decided to open her own cleaning business with her two sisters. There are only two more days left in our 12 Days of Small Businesses countdown. Be sure to check back to see our final features.